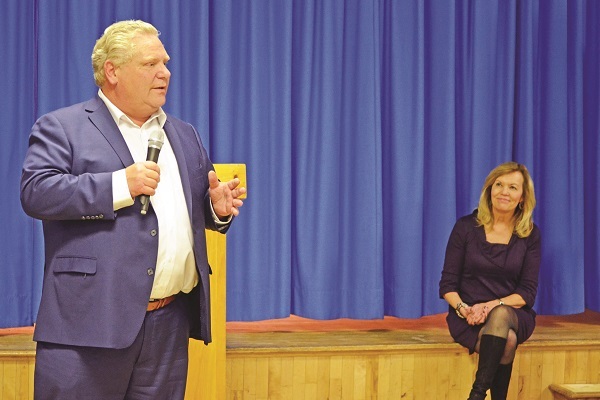 It was billed as an “Open for Business” rally with the Premier, but by the time Doug Ford arrived in Newmarket-Aurora on Thursday night, the Open for Business message had to take a momentary backseat to the future of healthcare. Premier Ford, accompanied by Deputy Premier – and Newmarket-Aurora MPP – Christine Elliott rallied the local party faithful at a pasta dinner at the Newmarket branch of the Royal Canadian Legion. The Premier’s visit to Aurora’s northern riding came just hours after the Ontario NDP released what they said was a draft government bill that would, if enacted, dissolve the Province’s Local Integration Networks (LHIN) in favour of a “super agency” to oversee the Province’s healthcare system. This, argued NDP leader Andrea Horwath would pave the way for more privatization of health care within the system, an idea dismissed shortly thereafter by Ms. Elliott, who also serves as Ontario’s Minister of Health and Long Term Care. This was underscored hours later at the Newmarket-Aurora rally, where Ms. Elliott reiterated the Province’s support for public healthcare. “We want to make sure we can deliver on all the promises we made to people during the campaign of 2018,” said Ms. Elliott before a crowd of nearly 150 Progressive Conservative supporters, who were seated alongside a number of other MPPs, including Aurora-Oak Ridges-Richmond Hill’s Michael Parsa. “Just this month, we had a couple of great events here, but what we’re doing at Queen’s Park is even more important in the sense that we are honouring our commitments. We’re working on our priorities and trying to make sure we can unravel what happened after 15 years of Liberal mismanagement, 15 years and $15 billion debt. We want to balance the budget responsibly. We are going to continue to find efficiencies that are going to add to the bottom line to work away on the debt and make sure we deliver programs and services that are relevant and necessary here in Ontario. It is necessary to achieve fiscal balance and restore public confidence in Ontario’s finances. “One that I am responsible for, is to build a healthcare system of the future. You may have heard a few things about that today, but we are working hard on that because what we have heard from the people of Ontario is they want us to continue to invest in our public health care system, they want us to transform the system because it is not working for people right now. Before touching upon Open for Business themes, including his fight against a carbon tax, removing cap and trade, and fostering business growth, Mr. Ford, who was introduced by Ms. Elliott, lead with health. “Christine is in charge and responsible for a massive part of our budget,” said Mr. Ford. “We always say in cabinet and Caucus, that this Province goes where health goes. It is [an] over 60-billion-dollars-a-year budget. 43 per cent of the overall budget is with health and you’re doing an incredible job, sitting down across the Province, getting some of the greatest doctors and nurses and frontline health care workers out there because we have taken a different approach to the health care. We actually are doing things a little differently: we’re actually listening to the experts. Ontario, he continued, is facing a time of “unprecedented growth, opportunity and prosperity’ and it is essential moving forward to cut red tape and regulations. This growth will be unlike anything the province has ever seen, he added, and that can be attributed to “getting out of the way” of business owners, small, medium and large.